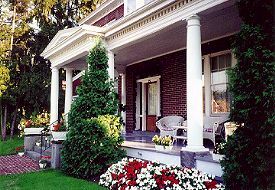 The Keystone Inn is a great 3 story brick, late Victorian house built in 1913. The handsome, leaded glass main entrance opens to a grand oak and chestnut staircase that dominates the center of the house. Flowered wallpapers, lace and ruffles decorate the bright, cheerful guest rooms. All rooms boast comfortable chairs and firm beds. Aunt Weasie's library offers books and games for your pleasure. All 5 rooms have private baths ranging in price from $105-155. One 2 room suite. Rates include full breakfast. Two nights stay suggested for weekends. Three nights on Holidays. 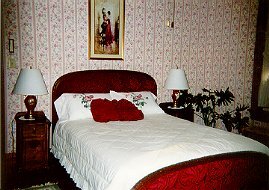 Weekday Bed and Breakfast Special, Sun-Thurs 4th night free. Our nonsmoking Inn does accept children. Winter packages available.